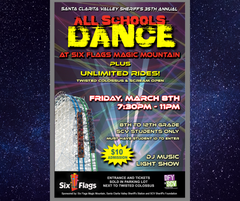 Santa Clarita Valley Sheriff's Station has partnered with Six Flags Magic Mountain for the past 35 years to host the annual "All Schools Dance." This year's event will be on Friday, March 8, 2019, from 7:30 p.m. to 11 p.m. at the Six Flags Magic Mountain theme park, and is open to all Santa Clarita Valley students, grades 8-12. The cost of admission is $10 per student (cash only) and entry will be at the gate near the Twisted Colossus ride. The event will include unlimited rides on the attractions Scream, Twisted Colossus, BATMAN The Ride, WONDER WOMAN Lasso of Truth and THE FLASH Speed Force. The theme park will be closed to the general public on the night of the event and will only be open to students for the "All Schools Dance." The "All Schools Dance" is closely monitored and supervised by Santa Clarita Valley Sheriff’s deputies and volunteers while students are inside the venue. For safety, we request that parents please drop off and pick up their children at the area next to the event entrance by Twisted Colossus. NOTE: This event is open only to local Santa Clarita Valley students; Participants must show student ID. In addition to unlimited rides, there will be a light show, and DJ music. Food will be available for an additional purchase. The yearly event is very popular with our local youth. It provides an opportunity for students from several different local schools to interact and have a fun-filled and safe night!